Common Size: 58" x 33"
26" x 22" 32" x 32" 36" x 27"
Shatter-resistant polycarbonate window with two tumble locks for added security. Swing-open door offers convenient and easy access when updating messages. Weather proof, black aluminum frame with sealed rubber gasket for use outdoors. Top, concealed lighting makes it easy for viewers to read in the contents. Power supply with 70" long cord produces a direct current of 12 volts, resulting in 30 watts of power for the LED lighting. These restaurant menu cabinets, outdoor display cases are great for displaying memos, letters, posters, schedules or menus! Each unit has a 53-1/4" x 28-1/4" interior which can hold up to (12) 8-1/2" x 11" standard sheets of paper. Another great feature about these outdoor display cases that have an interior corkboard is that there is a top LED light bar. The top light also makes it easy for passersby to read the content in the swing frame especially at night. 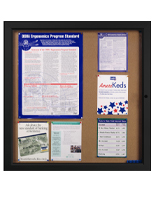 Enclosed bulletin boards are a great choice for use in offices, hallways, libraries, classrooms, hospitals and information centers. 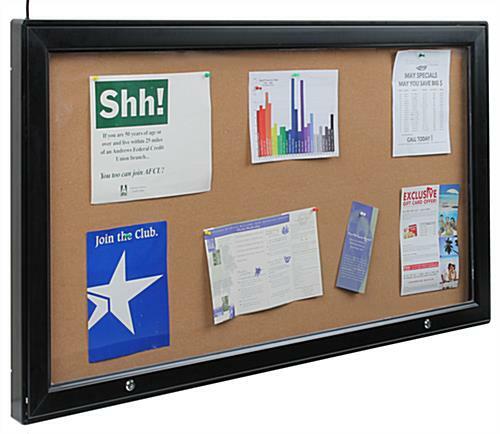 These outdoor display cases, also known as notice boards, are engineered from a durable aluminum frame to endure years of constant use. Each illuminated swing frame has four rounded corners that are safe for use in any busy environments compare to sharp edges. These outdoor display cases that are weather proof can applicable for use indoor or outside the establishment. 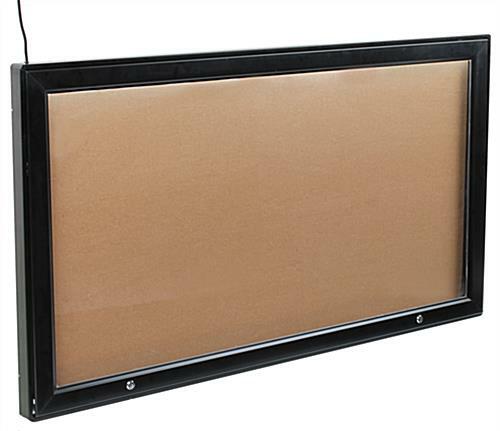 Each of this enclosed menu cabinet has a rubber gasket sealed around the frame to keep the moisture and other exterior elements from getting into the showcase. 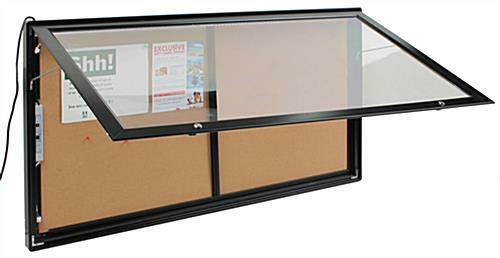 Inside these enclosed outdoor display cases, there is a large self-healing cork surface. 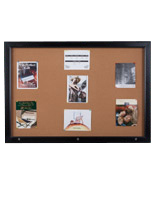 Messages and print-out can be easily attached on the easy-to-tack natural grain corkboard by using push pins, thumb tacks or staples. 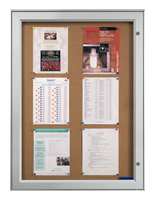 These illuminated notice boards, outdoor display cases that have a swing-open door offer an easy and convenient way to exhibit memos, notices, schedules and posters. 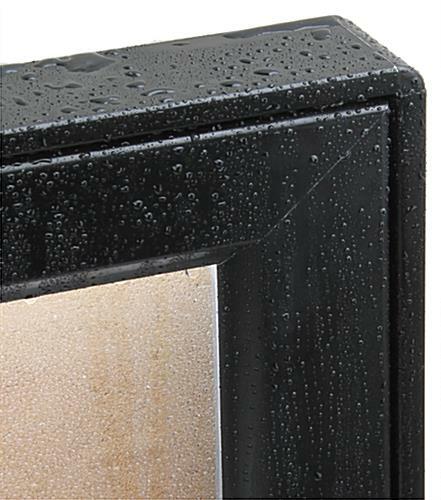 The purchase of these illuminated outdoor display cases also comes with a bag of push pins. Depending on how the menu cabinets are mounted, the door swings open from the side or opens up at the bottom for easy changes. 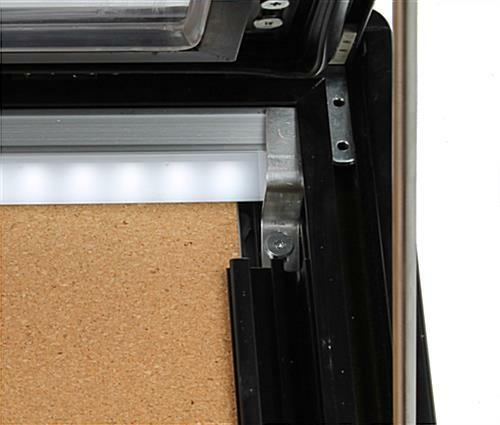 During the process of changing out the sheets, users can use the bar at the side to keep the door open and use both hands to attach the message to the corkboard. 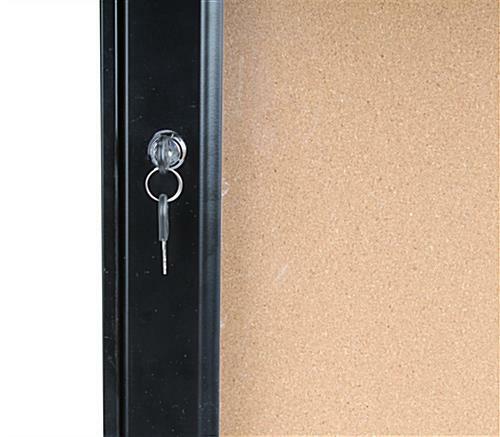 These restaurant notice boards also come with two tumble locks at the side of the door, making the cabinet ideal if tampering is a concern. 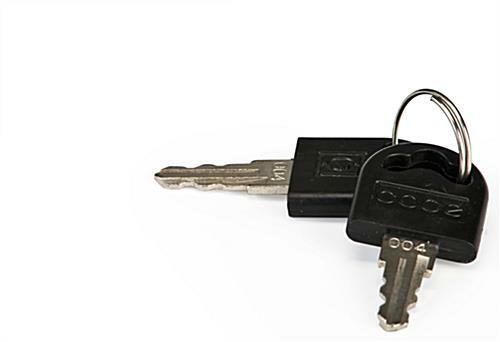 A set of keys will also be provided with the unit which only allows authorized personel to access the unit. The purchase of this unit comes with a 74" long power cord with grounded plug. Most real world applications utilize a professional electrician hard-wiring the unit directly into the wall power source. 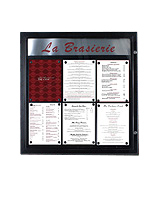 These exterior-rated menu cabinets can be mounted vertically or horizontally to the wall. 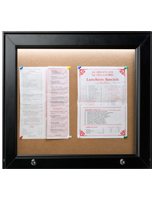 The purchase of these restaurant notice boards will include two Z-bars, screws and mounting anchors. 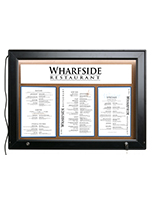 Keep everyone involved and up to date by installing this wall-mount illuminate menu cabinet today! 57.5" x 32.5" x 2.0"